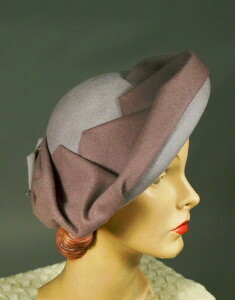 Two tone 50's vintage stylized beret. Taupe & gray felt, taupe grosgrain. Gray beret shaped form with low dome crown. Taupe felt applied in loosely folded pleats around the crown. Taupe grosgrain bow. Grosgrain inner band. The 50's classic, behold: the beret! Stamp on crown underside - MERRIMAC HAT CORP. Diameter, side to side - 12 1/2"
EXCELLENT! Shows a couple of tiny chews on underside. Overall wonderful condition.